We started in spring 2006, with Jeff Kelley (a designer in APL’s Space Department) taking the flight drawings and producing a set of drawings that sized the spacecraft one and one-half inches bigger on all surfaces except the model radioisotope thermoelectric generator (RTG) surface. This was because all other surfaces on the spacecraft had one and one-half inch “stand-offs” on them to raise the thermal blanketing of the surfaces for thermal and micrometeorite protection. This way we did not have to buy and attach over 100 stand-offs achieve the correct size of the overall spacecraft. Ron Prietz, Mike Steinfort and Bill Kulp built the main body of the spacecraft out of wood in the Applied Physics Laboratory’s model shop; Robert Harter painted it. Overall the main body, instruments, and power source (RTG) replica are very close to actual size. Wethen assembled the instruments, also accounting for the one and one-half inch size change. Most of the instruments were made of wood; some parts of the instruments and thrusters were made by a rapid-prototype procedure and some were fabricated in APL’s sheet metal shop. The only flight-qualified piece on the model is the LORRI door; it was the flight spare. David Napolillo designed the thrusters for the rapid prototyping. The model’s adapter ring (where the spacecraft meets the launch vehicle) is a non-flight spare. The author (center) goes over the New Horizons model with Smithsonian National Air and Space Museum staff. Once we had all the pieces, I designed and built the thermal blankets – the multilayered insulation – to look like the flight MLI. The outer layer is made of the same material (kapton) that was used on the actual spacecraft. The louvers and Student Dust Counter were made from spacecraft prints and pictures by the APL reproduction shop and were adhesive-backed, so we could just attach them to the outside of the blanketing. The REX (radio science experiment) dish is a spun aluminum dish we had used for testing the Near Earth Asteroid Rendezvous (NEAR) spacecraft – we painted and modified it to resemble the real New Horizons dish by adding the low- gain and medium-gain antennas, and thermal blankets. The model’s dish is not exactly to scale with the real dish; it is approximately four inches smaller in diameter. The RTG tower used on the model was made of aluminum; the flight tower is titanium. The collar with the cooling fins between the tower and the RTG is a flight spare; the RTG replica was made in APL’s metal shop out of sheet metal and aluminum plate by Jim Beatty. After all pieces were assembled in APL’s Space Simulation Laboratory, the model was on display there for a few days. It then was disassembled and shipped to NASA Headquarters in January 2007 to be on display for the Jupiter encounter “preview” press conference. It then was disassembled and returned to APL on February 11, 2007. Donald Carey, Henry Graham, Williams Jones, Scott Jackson, Ron Prietz and I were involved in the shipment to and from NASA Headquarters. It was re-assembled and put on display in the Space Simulation Laboratory until it was disassembled again for shipment to the Garber Facility of the National Air and Space Museum in Suitland, Md. 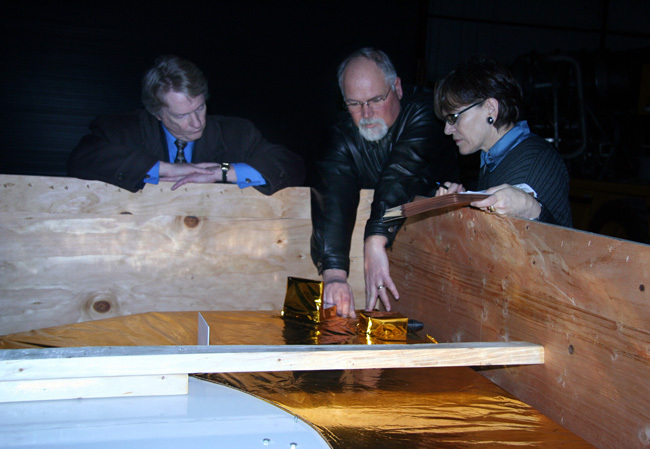 We uncrated the spacecraft at the Garber facility and discussed the pieces and assembly with the personnel at Garber so they could prep the model for shipment to the Udvar-Hazy facility on January 23, 2008. The model was then assembled by the Garber facility, shipped to the Udvar-Hazy facility in Dulles Va., and put on display July 11, 2008. The model was officially dedicated during a ceremony on October 17, 2008.